Hey there and happy Monday to all my fine crafty friends! Another weekend flown by and me left wondering where it went to. Seems like they all go by so fast. I did find time to create a vintagy inspired graduation card with the Accolade Collection from Authentique and boy do we need it this time of year. Isn’t this a great combination of plaids and stripes and vintagy images? Well done Authentique! In my world you can never mix too many patterns…..as long as you have a solid border between and mix up the scale. Basic buttons and a small collection of coordinating flowers are the perfect embellishment choice. And of course don’t forget a sweet little loopy bow of bakers twine. The vintage image has a chipboard frame altered with a metallic embossing powder that matches the clip. I’ve tucked in a doily cut from black cardstock and topped it off with a fun bingo card from the patterned papers, and a fussy cut typewriter. Foam spacers between the layers help to add dimension. Please enjoy this process tutorial video I created for this card……. Hello there and happy Wednesday to all you fine crafting friends! I’m just so honored and excited and tickled pink to be sharing my first project as guest designer for Authentique. I love the paper collections so so much and the quality and variety makes it fun and easy to work with. Speaking of fun…..the Dame collection is just that as well as being vintagy and playful. I’m using it for this mini album and I hope you enjoy viewing it as much I did creating it! For the cover I stacked up the patterns with a double layer of cardstock to keep it from getting too busy. The sweet sentiment was on a cut apart and I simply snipped around it leaving a border then added it on top of an altered chipboard frame. Loads of coordinating flowers are arranged to accent the sentiment. The tag stickers from the sticker sheet make great embellishments when applied to cardstock and snipped out then attached with spacers to add depth. An additional sticker is added to the top and given a smaller cluster of flowers and vintage button. I like to treat the pages as a set in albums to give them a pulled together look. This first set has a die cut doily with a circle of the patterned paper to act as a picture mat. It’s topped with a tag from the sticker sheet popped up on a spacer to add dimension. A banner cut from the papers has die cuts from the collection to fill in and coordinate. I like to have at least 1 clip added that can be used to secure photos or keepsakes that have writing on the back that would be lost if adhered to to page. I’m so in love with the cut aparts that I couldn’t bear to cut them down so I’m using them just as they are and adding them as tip ins. The back side of the tip ins is a great place to add journaling. These pages have more die cut banners topped off with collection stickers. The pockets have tags for pictures. There’s plenty of room to add other flat keepsakes and mementos. This tag tucks under a belly band. There’s another clip to keep the tag snugly in place until more layers are added to the tag to bulk it up. This tag is larger and would be great to add bigger pictures. The back has the pink cardstock layer so there’s loads of space for writing up those special family memories. It’s just amazing to me how well all the patterns go together! This is a similar layout as the first 2 pages but this time there’s a pocket. One more large tag. You can never have too much room in a scrapbook! To dress the cover I added several charms of metal and crystal to coordinate with the patterns papers. One last bow and vintage button are the perfect finishing touches. Please enjoy this short video flip through of this mini album……. Dame Collection/ 12 x 12 Patterned Papers, 6 x 6 Paper Pad, Components Cardstock Die Cuts, Details Cardstock Sticker. Spectrum Cardstock/ Bubble Gum Two. Assorted die cuts, assorted flowers, ribbon, twine, vintage buttons, chipboard, metal and crystal charms. Hello there and happy Monday to all of you fine crafty friends! I hope you enjoyed a relaxing weekend and maybe had a little fun too! I had fun working with the new collage sheet from our shop. I looked at it and for some reason Tim Holtz paper dolls popped into my head. So I created a very vintagy and layered tag as an ode to Tim. Isn’t that little boy just the cutest????? I think he looks fabby on the printable. I’ve added some flowers to coordinate with the image background and tucked in some fun metal bits to fill in the arrangement. There’s a bit of acrylic film strip covering the printable but since it’s clear it just adds a pattern and doesn’t conceal the image. The tag is a stash buster and I think it may be from Pink Paislee for ages ago….but I think it coordinates perfectly! I’ve topped it off with a chipboard sentiment and added a crips white diecut doily to brighten up this arrangement. I think I’m going to get a lot of use out of this printable…..I’ve already got some different tags in mind to try out. Or maybe a card or banner? Hello there you fine crafty friends and happy Sunday to all of you! Its kit day woo hoo. You know that gets me all excited. There’s just something about the potential when you open a kit and see all the yummy pieces to mix and match with endless possibilities. For this kit I wanted to offer a variety card theme so it could be used to cover loads of card needs like Birthday and thank and and so on. Some are retro, some are vintage, and some are of a more masculine appeal. Here are the cards I created with the kit and a few odds and ends from my scrap and salvage box….. If you want to check out this kit and see all the yummy paper pretties that are included hop on over to the Polly’s Paper Studio shop on Etsy…..
Hello there and happy Friday to all of you. How can it be Friday already? The weeks go by so fast it’s hard to keep track. Today I have a card to share with the new Early Bird collection from BoBunny. I am swooning over this entire set. The colors are soft and dreamy and the florals are gorgeous! I really love that the flowers on the patterned papers are stylized so they have an updated vintagy feel. The color scheme has soft aquas and rose shades. I matted the papers with a slightly darker aqua to keep the patterns from getting muddled. And since you can never have too many flowers I piled them on here along with some pretty altered chipboard feathers, ribbon, and pearly headed stick pins. There’s an additional chipboard element here and sisal to bring texture. In the Noteworthy package of die cut elements there was a gorgeous wreath so I layered that onto a die cut doily then topped it off with the sentiment. A coordinating clip and a few pearly embellishments are the perfect finishing touch. Hello there, Friends, and a happy day to you all! 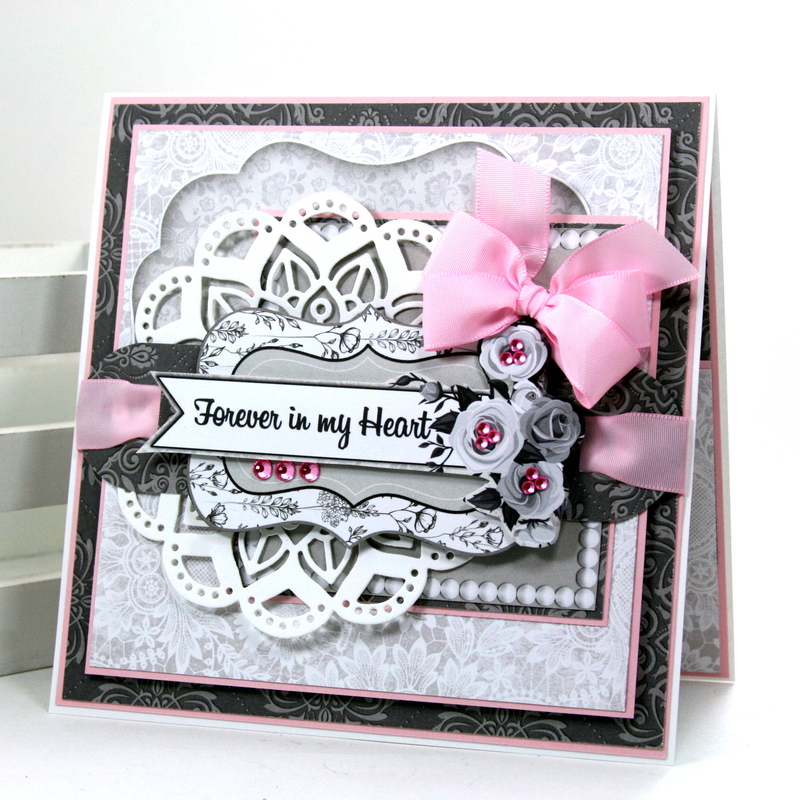 I’m here to share two cards that I created with the Black Tie Affair collection. If you’re thinking I’m going classic black and white these cards might surprise you. This collection works for shabby chic inspired projects too! I’ve pulled out the whites and grays for these cards and layered them with sweet soft pink cardstock. This 6 x 6 card has loads of Noteworthy pieces and a large die cut doily. To make the ribbon slide I used the Alphabet Punch Board from We R Memory Keepers and created the tops of two A’s but on opposite ends of a long strip. I simply wound the ribbon through then wrapped the tails and secured them on the back. A few Double Dot Jewels are the perfect finishing touch! This card is A2 sized and has more of the cut aparts and a smaller die cut doily. For this ribbon slide I punched the ends like in the previous slide…but left the ends squared off. I also trimmed a bit to make it narrower so as to fit the scale better. The scrap from the cut apart makes an excellent tag when given a coordinating metal eyelet and twine. Instead of my usual poofy bow I created a smaller ribbon embellishment with the trim and secured it in the center with a Double Dot Brad. I’m having loads of fun creating unique embellishments with my Alphabet Punch Board. Of course it’s great for letters too! Hello there and happy Monday to all you fine crafty friends! I’m sharing a project I created especially for the April Challenge on the G45 Community FB page. The theme for this challenge is to upcycle or recycle. Of course I’m down for this! I love to recycle!! I’m using this acrylic packaging from some brads as a shaker element for a card. I was so happy to see that if I cut the center out of the middle of one of the ephemera cards I could slip the outside around the packaging and it fit perfectly! I created a bit of a base to add the center of the card to so I could sandwich in the sequins. You all know how I love my sequins! A garden of pretty coordinating flowers to top off the corner of the shaker. This poofy bow in chevron topped with twine and a vintage button are the perfect final touch for the outside of the card. Inside there’a a pocket that holds a tag with plenty of room for a gift card or small flat keepsake or memento. The tag is a great place to add a sweet sentiment. Please enjoy this process video I’ve created to show all the steps for creating this fun shaker card…..
Make sure you stop on over to the G45 Official Community Page to check out how you can join in the fun with this great challenge…and to get loads of crafty inspiration. Really Reasonable Ribbon~ Chevron Stripe on Twill Champagne, Open Roses Royal Blue, White, Sweetheart Blossoms Blue, Cherry Blossoms Yellow, Magnolia, Rose Bud, Burlap String Navy.